We don’t always give cattle the credit they deserve. They are quite trainable animals and there’s a school where people can learn how to implement practices that take advantage of the predictable behavior of cattle. The Nevada Stockmanship School is an annual event that teaches livestock and rangeland managers the fundamentals of enhancing and protecting rangelands by managing cattle with a gentle touch and herd behavior training. 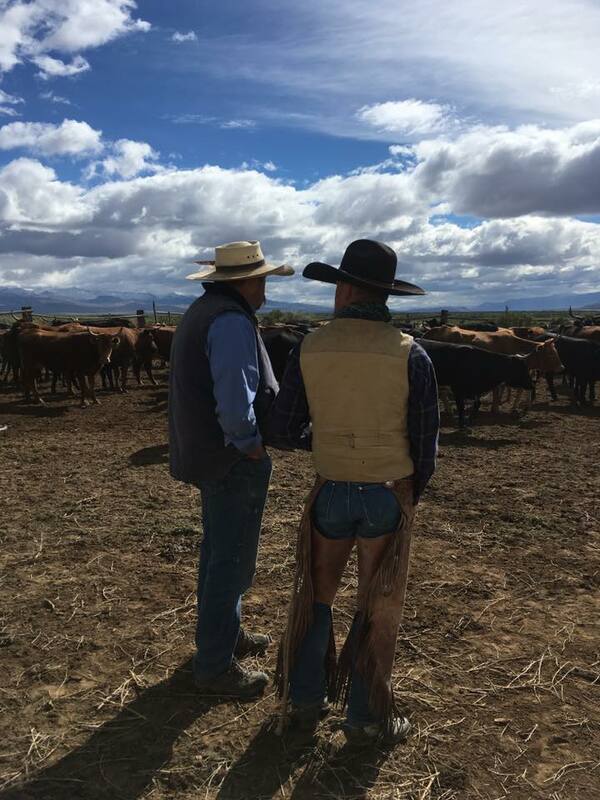 Riders attending this school learn how to place and effectively move cattle where they are wanted, for specific periods of time, providing the positive environmental outcomes of specific targeted grazing and targeted rest. Stockmanship is recognized as a useful management tool applicable across western rangelands. “An animal has a tenancy to stay where it’s more comfortable,” said Duane Coombs, Outcome-based Grazing Program Coordinator partnered with the Bureau of Land Management (BLM). “In the past, we’ve harassed cows out of where we don’t want them to be. But if they were happy there, they will want to go back.” Using stockmanship creates a sense of comfort for the herd that allows cattle to be happy in places useful for managing land. Livestock might be accustomed to living in those riparian or wet meadow places, but riders can work to change their behavior to get them to use other portions of the range that are normally underused. This is better for the range and better for the cows. In addition to protecting critical areas like sage grouse leks, elk calving areas, fish spawning and riparian areas, implementing low-stress livestock handling principles and techniques can be good for a rancher’s bottom line. By decreasing herd stress, this can lower health costs, such as the likelihood of ingestion of poisonous plants, increase weight gains, reduce or eliminate weight loss in calves at weaning, and increase grazing capacity through better utilization of hard-to-get-to areas. Stockmanship can also be used specifically for targeted grazing to reduce the fire fuel load on the range. With this increased livestock management effectiveness, the costs of ranch labor can be decreased due to fewer people being needed to move livestock. Another benefit to using these principles and practices taught at the Stockmanship School is that they can be employed within any existing grazing management systems. Although adequate water is essential, stockmanship can be used with or without additional range improvements. As such, a lengthy public lands management process is not required to implement stockmanship on public rangelands. Zak Morgan is the Cow Boss at the Roaring Springs Ranch in Oregon and he attended the 2018 Stockmanship School. After attending the 2018 school, Morgan said he played with it a little on the ranch’s private lands to see if he could make it work back home. At the Roaring Springs Ranch, Morgan runs cows alongside sage grouse, redband trout, feral horses, and a newly established population of elk. Managing forage for all these species can be a unique challenge, but he said the style of stockmanship works well for all the competing needs of these animals. “It kind of sounds like voodoo magic but it’s really incredible to see it work and that’s what I want to bring this school here in 2019,” Morgan said. June 11 – 14, 2019, the Stockmanship School will be hosted on the Roaring Springs Ranch in Oregon, and Morgan said the ranch’s landscape will provide fresh cows of different breeds, all sorts of different terrain, and all the possible scenarios to test and challenge these stockmanship methods. This ranch is one of the 11 national BLM Outcome-Based Grazing Demonstration Projects. Nevada’s Cottonwood Stockmanship School is made possible thanks to support from the National Riparian Service Team, BLM, University of Nevada Cooperative Extension, NDA, the Nevada Association of Conservation Districts, Cottonwood Ranch, and the U.S. Fish and Wildlife Service. The third annual Cottonwood Stockmanship School will be held in October. For more information about the upcoming Stockmanship Schools in Nevada and Oregon, please contact Dave Voth at dvoth@agri.nv.gov or (775) 738-8076.